Traditionally, circus is about fun, bright colours and laughter. 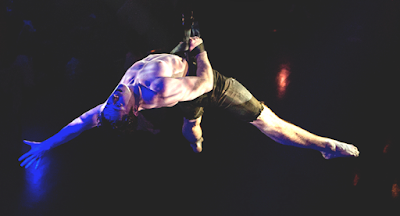 However in the 2015 Melbourne Fringe circus show, Barbaroi, circus is transformed into a dark, gritty and dirty art form. Coming out of the darkness, there are shady characters and misfits of society. It’s an enthralling hour of entertainment from the seedy underbelly of the arts. There is barely a lull in Barbaroi with the audience kept on the edge of their seat for its entirety. Bock steals the show with her two foot-juglging sets that are just gobsmacking in their skill. She plays the femme fatale-esque persona with the right amount of sass and attitude, which results in her having a strong presence on stage. Strong men Meager and Ricketson are amazing to watch during their teeterboard act and not just due to their physique, as they achieve some phenomenal flips and twists. You would think The Barbaroi couldn’t make their acts any more difficult than they already do but then they turn the dial up even more and still breathtakingly succeed. Even Carlson’s bottle walking act completely changes our expectations and difficulty with just a simple action. The clapping and cheering from the audience at the conclusion of Barbaroi's opening night was more than well deserved. There is a high calibre of talented circus performers on display that deserve to be seen by many people during its two week run. It is high octane circus that will have your eyes glued to the stage and your heart beating at rapid speeds, until the lights literally go out.